The rotary dryer also known as tumbling dryer is an equipment employed to minimize the moisture content of a feed material by bringing it in direct contact with a heated gas. 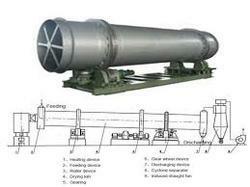 It consists of an inclined long drum or cylinderical shell often fitted with internal flights or lifters; rotated slowly upon bearings through which the material to be dried flow with a tumbling/cascading action in concurrent (for heat sensitive materials) or counter-current flow with the heating air or gases. The movement of the material is due to combined effect of inclination of the shell to the horizontal and the internal tumbling action or mechanical turn over thus the name tumbling dryer. The nature of the feed determines the directions of gas flow through the cylinder and it is relative to the solid. This drying equipment can also perform batch or continuous processing of the wet feed.